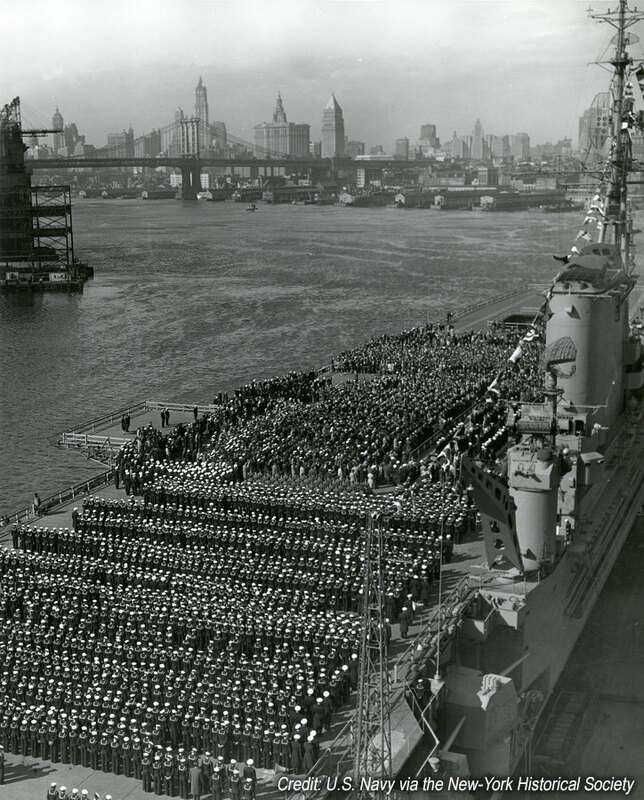 World War II was over, and the soldiers were coming home. 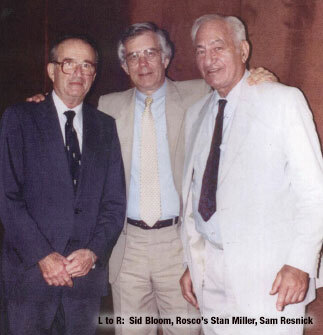 Young Sid Bloom and Sam Resnick stood on the deck of a troop ship steaming west across the Atlantic back to the States. The two men knew each other casually—their families were friendly back in Brooklyn—but the conversation they struck up during their passage back to the States would cement a lifelong friendship and give birth to a remarkably successful business. It was a time of optimism, a sense that as long as you worked hard and smart, you could find success. Sid and Sam talked about starting a business together. What kind of business? Well, everyone needs light bulbs, they thought. That settled it. They would go into the electrical supply business. So Sid and Sam began learning the ropes, working for an electrical distributor. In 1947, they bought him out and became the official owners of the business they now called Barbizon Electric. The name had special significance for Sid, who had spent time in the Barbizon region of France during his tour of duty. Back in New York, he was reminded of the name while strolling with his wife past the Barbizon Hotel. Barbizon would make a great business name, he thought, and besides—it would be near the beginning of the alphabet in the Yellow Pages. The early Barbizon Electric had four employees and a product line ranging from light bulbs to toaster ovens and, eventually, A.C. Gilbert toy trains. If it used electricity and customers wanted it, Sid and Sam would get it for them. They taught their small staff that they needed to know everything about the products they sold, and they needed to provide great customer service, always. Sid and Sam complemented each other perfectly. Sid was the consummate salesman, spending his days with anyone who would let him into their office. Sam was the inside man—he always knew exactly what was in stock, even before inventory was computerized, and he would get you just the right price. In the early fifties, they moved the business to a location on 10th Avenue, in the Hell’s Kitchen neighborhood that was also, coincidentally, home to the film and still-young television industry. In 1958, in a major technological breakthrough, Sylvania (today called Osram Sylvania) released the new tungsten halogen lamp. Sid and Sam championed the new lamp, preaching its benefits—brighter light and longer lamp life—to anyone who would listen. Barbizon became the first US distributor of these new lamps, which would eventually become the lamp of choice for the entertainment industry. 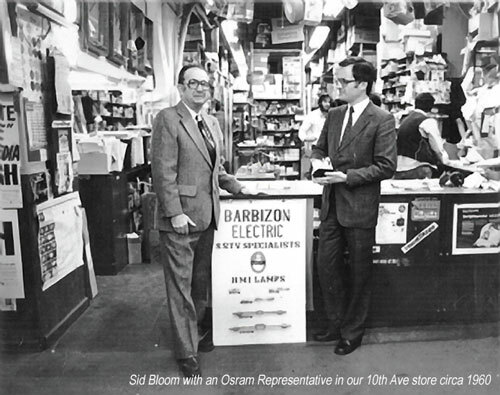 Sid and Sam quickly learned that lamps moved a whole lot faster than trains, and with the advent of this new lighting technology, lighting supplies quickly became the focus of Barbizon’s business. Barbizon kept a vast supply of stock of these new lamps; network engineers and gaffers began to rely on Sid and Sam not only for the product but also for their knowledge on how it could be used, be it for film, television, or theatre. Last-minute production demands became Barbizon’s daily order of business; it became the go-to place to get production supplies. Calls began to come in from around the world with questions about lamp uses, which led to more sales. A year later, GE released its patented version of the lamp, and Barbizon became its leading distributor. Barbizon continued to embrace cutting-edge products and technologies, becoming a distributor of Rosco’s new color filters, developed in the sixties to work with the new hotter burning lamps. Later, Barbizon was an early promoter of the Osram HMI® lamp. In the mid-seventies, Barbizon settled in its present home on 55th Street in New York. Network studios and the film community were just to the west and the bright lights of Broadway to the east. It was an ideal location. With more available space, Barbizon increased its inventory and product lines to include a full line of production expendables, grip, and lighting equipment. In 1979, Sid Bloom’s son-in-law, Case Lynch, was convinced that the business could expand. 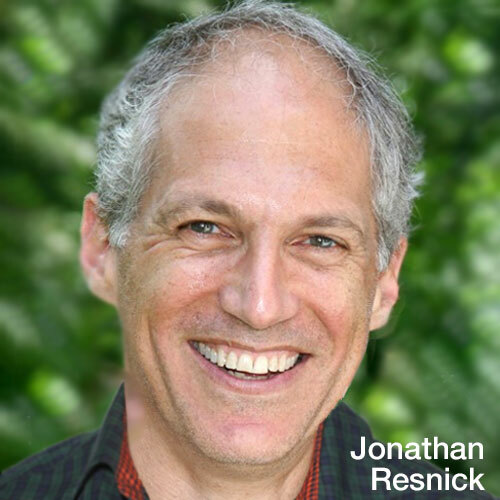 He opened an office in the Boston area, selling lighting equipment and production supplies, as well as working with production facilities to install dimming and control, pipe grids, and power distribution. Engineers and studio designers embraced the idea of the studio systems integrator. Sid and Sam, although wary at first, liked it too—Barbizon could sell and install the lighting fixtures that would need lamps and gel. The idea of systems groups caught on, and over time Barbizon’s growing number of offices would hire individuals who understood how theatrical systems worked. Consultants and engineers would have a comfort level knowing the systems they envisioned would be installed correctly. The eighties saw continued expansion. Management noticed that a lot of shipments were going to south Florida for movie productions, and in 1984 Barbizon opened the West Palm Beach office. The film business continued to boom as Barbizon became the exclusive east coast distributor for Mole Richardson. In 1986, Barbizon opened an office in Washington D.C. to serve the burgeoning production community working in the Mid-Atlantic region. Barbizon added more offices in the nineties in Denver, Atlanta, Dallas, Charlotte, Orlando, Chicago, and Phoenix. During this period, Barbizon initiated something relatively unheard of in the entertainment industry: an ESOP or Employee Stock Ownership Plan. Case Lynch and Jonathan Resnick, Sam’s son, both felt it was important that employees have a vested interest in their future, and created the ESOP for all Barbizon employees. Employees were now part owners of the company. Barbizon had been shipping internationally for years, but the company became a true multinational with the 2001 opening of its London office, followed by more recent openings in Australia. What began with light bulbs and toy trains is now a fully integrated, specialized lighting company that services television, film, theatre, houses of worship, and architainment facilities across the globe. HMI is a registered trademark of OSRAM GmbH.